Stepping out after a sumptuous dinner, Madonna looks every inch the groomed superstar. Dressed in an elegant beige safari suit with her glossy hair tied back, the singer turned heads as she left Claridge's in London on Saturday night. One onlooker said, "She looked very smart as she left the hotel, and seemed cheerful." The businesslike attire was a far cry from the laid-back look the 48-yearold adopted a fortnight ago on a controversial visit to Malawi with son David Banda. There she was happy to dress down in a T-shirt and sarong and let her wavy hair hang loose. With husband Guy Ritchie out in the West End, Madonna cut a some-what lonely figure as she left the hotel after dining at Gordon Ramsay's restaurant. The couple have spent a lot of time apart in recent weeks, sparking speculation that they may be feeling the strain of the intense media circus surrounding her Malawi trip. Friends say Madonna is looking for a little girl to be a 'sister' to 18-month-old David, although her publicist has denied this. But it has emerged she will be unable to adopt another child until legal difficulties with David are resolved. 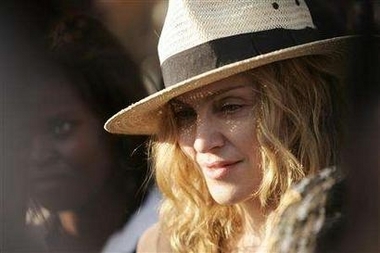 The TV show American Idol broadcasted the Madonna's message which was pre-recorded during her trip to Malawi. As part of the Idol Gives Back charity event, Madonna will deliver a pre-taped message during Wednesday night's special two-hour results show of American Idol, a representative for the singer confirmed to Access Hollywood on Tuesday. The event is designed to raise both awareness and funds for organizations that provide relief to children and young people living in poverty in Africa and America. "I'm gonna blow [a secret] now: Madonna came on board yesterday," Idol executive producer Nigel Lythgoe said as a guest on Ryan Seacrest's KIIS FM morning radio program on Wednesday, according to Access Hollywood. "And that is just fantastic." While the 48-year-old is most recognizable for her work as a singer-songwriter, record producer, film producer, fashion designer, dancer, author, and actress, she is also a well-known humanitarian, having worked with numerous philanthropic organizations over the years. Pop icon Madonna is reportedly to follow in her husband's footsteps by directing a film. The performer is to take on the role of director in the low-budget comedy Filth and Wisdom. Filming for the upcoming movie begins in London later this month. A source at The Sun told how Guy Ritchie was pleased with his wife's new endeavour: "Madonna has Guy's full support. It may seem like only yesterday but 25 years ago on April 24, 1982, Sire Records honcho Seymour Stein released a single called Everybody on Warner Bros. Records by an unknown singer from Rochester, Michigan by the name of Madonna Louise Veronica Ciccone. To say the world would never be the same is an understatement. The song went on to become a huge dancefloor hit and was heard all over the radio in the Summer of 1982. That little girl from Michigan would go on to become one of the most famous entertainers and cultural icons in history - selling close to 200 million records and remaining a star of enormous magnitude and influence for the next 25 years. She's just getting started. Long Live the Queen and Happy Anniversary to Madonna. Madonna and Sir Elton John have two nominations each for this year's Ivor Novello songwriting awards. Madonna's track, Sorry, which appeared on her album Confessions on a Dance Floor is up for international hit of the year and most performed work. I Don't Feel Like Dancing, written by Sir Elton and performed by the Scissor Sisters, has also been nominated in the same categories. This year's Ivors will be held at Grosvenor House in London on 24 May. The awards honour British songwriters, composers and music publishers. Other nominees this year include the Arctic Monkeys, with their track When the Sun Goes Down, for best song musically and lyrically. Amy Winehouse, Hot Chip and the Bodyrox are competing in the best contemporary song category. Robbie Willliams is up against Madonna and Sir Elton in the international hit of the year category for his single Rudebox. The album, also called Rudebox received lukewarm reviews when it was released last year. Nominees in six categories, including best TV soundtrack and best original film score, have been announced ahead of the event. Another nine other awards - which include prizes for best album, international achievement and songwriters of the year - will be presented on the day. Madonna and the Malawian baby boy she is trying to adopt flew out of Lilongwe on Sunday bound for London after a six-day visit which saw her tour orphanages that she is helping fund. The US pop star's private jet, parked far away from the main terminal of Kamuzu International Airport, took off at 2.25 pm (1225 GMT). Holding one-year-old David Banda and accompanied by her biological daughter, Lourdes, Madonna arrived at the airport with her entourage in two vehicles before getting in the plane. She gave no comment to reporters who had gathered at the airport on the outskirts of the Malawian capital. The singer is in the process of adopting David and was awarded interim custody in October. It was the first time that she and the youngster had been back to Malawi. During her trip, Madonna took David back to the orphanage where he had been living until she began the adoption process last year and also met with street children and prostitutes at a government-run rehabilitation centre. Thesinger attracted large crowds and widespread media attention during her trip to Malawi, one of the poorest countries in Africa. While her move to adopt David has prompted widespread criticism outside Malawi, locals have been overwhelmingly positive about her visit, seeing it as a chance to put their country on the map. 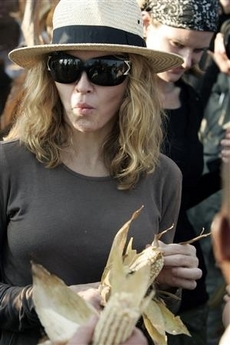 "I am quite sure many people outside the country started to know about Malawi because of her," said Mest Sinati, a gardener who lives close to the luxury lodge where Madonna stayed during her visit. "People who have money to spare should emulate her example of helping poor people like us," he added. Although David's mother died shortly after giving birth, the visit saw an emotional reunion between David and his father Yohane. Madonna, the one-time backing dancer who grafted her way to becoming the "Queen of Pop", on Thursday urged Malawian youths to work hard to realise their potential. "Keep working hard. I hope you realise how much power you have to make a good future for yourselves," the US singer told scores of cheering and dancing villagers when she inspected a modern-day care centre her charity Raising Malawi Organisation has built at Mphandula village, 50 kilometres (31 miles) west of the capital Lilongwe. Making her first public speech since she landed here on Monday to continue her charity work in this impoverished African nation, Madonna, wearing a maroon T-shirt with the word Love, said: "It is exciting to be here at the centre. "It was a bush before and there was nothing, now there are these beautiful buildings." With toddler David Banda, the Malawian boy she intends to adopt, Madonna said inside a hall built as part of the centre: "It is not the buildings that matter, but your kind heart for giving this land freely." "Remember, this is a partnership. I have heard people say please come back, this is a partnership and also help yourself and do your part." Alfred Chapomba, founder of the Consol Homes orphans charity, which has partnered Madonna's group, gave the star a half-hour tour of the campus as women danced and sang praises to their important visitor. Traditional chief Kalolo thanked Madonna for the infrastructure, saying: "We are now proud villagers who are seeing this type of development for the first time in our lives." The chief told Madonna to continue developing the village, home to about 2,500 people, but with neither running water nor electricity. "Thank you for everything." A local band equipped with home-made instruments entertained Madonna for 10 minutes, with the "Material Girl" and David throwing a step and dancing to the amusement of the villagers, most of whom did not wear shoes. Madonna kept urging David to dance and clap hands, and he responded as the villagers cheered on. Aida Kapondera, 62, vigourosly danced with Madonna for 10 minutes to the sounds of the band. "I enjoyed dancing with her," Kapondera told AFP, wiping sweat from her forehead. In the new issue of US Weekly magazine, an article of Madonna & Justin Timberlake is featuring. It is said that they recorded 3 or 4 dance tracks together. The album won't be hip-hop exclusive, it will feature "lot of different sounds and styles". One of the tracks is reportedly "Britney sounding". 18 April - "Madonna really wants to help children"
Madonna is assisted for her Raising Malawi project by the Belgian Philip Van den Bossche. Jan Ruysbergh from Belgian newspaper Het Nieuwsblad interviewed Van den Bossche, giving some very interesting insights on this projects. 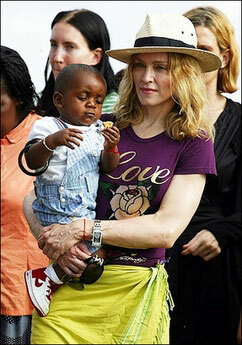 Since superstar Madonna has adopted baby David, everybody knows where Malawi is. For the project Raising Malawi, the Belgian Philip Van den Bossche is the popstar's right hand. "If everybody helps, we can give the orphans over there some hope again." In October last year, the whether or not fraudulent adoption of the African totler David by Madonna caused a media storm. But Madonna didn't let the protest distract her. "I only want to give a child a chance of a future and at the same time I want to show the world how bad the situation in Malawi really is." she said. 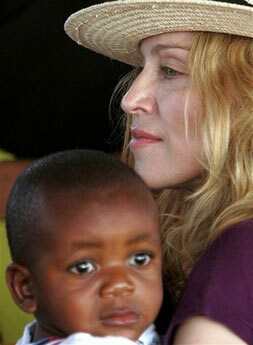 This week Madonna is again in Malawi with David to supervise the construction of an orphanage. At her side is the Flemish Philip Van den Bossche, who is leading the entire Malawi project. How does a Flemish person gets to Madonna? Philip VDB: "It's my passion to help people. Whether I'm Belgian or Flemish doesn't really matter. Let's just say I at the right place at the right time when the opportunity occurred." "I've been living in LA for 2 years now but I grew up in New York. My parents moved here to realise their American Dream. I used to travel backand forth between Belgium and the US a lot. My family still lives in Belgium, mostly in Antwerp. My mother's family lives in Hasselt. Unfortunately, I don't see them often. However, Belgium is in my heart. It's a special country with very special people." You work closely with Madonna for her Raising Malawi project. So you've visited the country quite a few times. "Yes I keep an eye for all the projects of Raising Malawi, the funds of Kabbalah leader Michael Berg and Madonna. In January 2005 I travelled to Malawi to start the project. Since then I've been there 7 times. The goal of my last visit was to have Madonna get to know the programs of the different regions. Madonna had the chance to meet a lot of people, among which many political leaders. It's a totally different thing to experience everything on the spot instead of reading about it or watch TV reports on it. I've known Madonna for a few years but I knew that because of this journey she'd get involved in the project even more actively. Meanwhile she's been busy raising funds for the children in Malawi." Was it easy to convince her to go to a poor country? "No need to convince her. Madonna wanted to go herself from the beginning, it was just a matter of timing. Someone like her always has a full agenda." Which were the most emotional moments for her and for you in Malawi? "It is always very touching. There are children that urgently need food and medical care, love, attention,... Malawi has 13 million inhabitants, of which 2 million orphans and vulnerable children. Then you immediately know something is wrong." "Of course I can't speak for Madonna but one of her most touching moments was when she visited the 'peri', an area between the city and the countryside. In this part the people are very poor and it's a dangerous place to live. We have also visited a home for help needing children; the oldest child there was 10 years old." "It's heart breaking to see that children grow up without relatives to take care of them. But I don't want to paint an image of Malawi as a depressing country because the people are always smiling and they are really friendly. Malawi is a country that can change. It is a beautiful country with beautiful people, but there are problems that need to be faced. 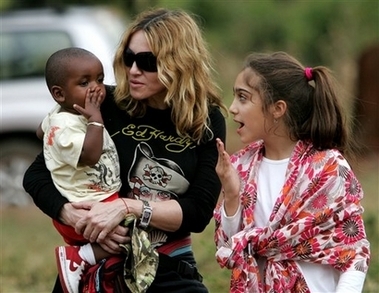 When we visited different orphanages, Madonna too started hoping we could make a difference." Is there already a significant difference because of your projects? "If we can raise more funds, more support of volunteers and donors all over the world, we can get there. There's already a slight progress and in many cases children that didn't use to have food before, get food now. We're building medical facilities with drinkable water and lots more. There are many projects set up that will start giving progress within two years." The past few months there was a lot of commotion about the adoption of baby David by Madonna and her husband. "The adoption was a personal matter and I believe it should remain that way. It is nobody's business that they've decided to include another member to their family. Knowing Madonna and Guy, they had nothing but good intentions, they're very loving and caring parents. I think they wanted to offer the child chances that it wouldn't have had otherwise. I just know that David will come back to Malawi and share his experiences with the children and people of Malawi." Madonna's involvement apparently didn't just include the adoption? "Madonna will always be part of Raising Malawi, because she is one of the co-founders, it's her initiative, together with Kabbalah leader Michael Berg. Kabbalah believes in the ending of pain and suffering in the world. One of the ways Michael Berg does this, is by providing aid in different parts of the world, such as Africa. We hope that many people will support our project, not just with money, but also by becoming a volunteer. That's why we set up the new Volunteer Malawi project, which will allow people to go to Malawi and work as a volunteer for a short or a longer while." Finally: Madonna is known as a demanding woman, a control freak. What are your experiences in working with her? "She is not the diva many think she is. She is focused to help, to make the life of many children better and she does it as driven as she does with her career. She always puts herself high standards and she expects the same from the people she works with, but she does it in an atmosphere of love and friendlyness. If you call that demanding, then she is. But so was Gandhi." On both the US Billboard Hot 100 and the UK Top 75 Singles charts, Timbaland's lead-off single of the album 'Shock Value' is sitting at the #1 spot. The track 'Give It To Me', which features both Nelly Furtado & Justin Timberlake, is the latest in a string of big hits of Timbaland-produced songs of the past year. While Timbaland has been in the music industry for several years and he has worked with many people already (most notably Aaliyah & Missy Elliott), he became the biggest name in 2006 with producing several big hits for Nelly Furtado & Justin Timberlake. Currently, he's working with Madonna, together with Justin Timberlake. Could it be that Madonna's next single is meant to be another transatlantic hit? While Madonna has 12 #1s in both the US & UK, 'only' 5 of them became chart toppers on both sides of the pond: Papa Don't Preach, Who's That Girl, Like A Prayer, Vogue & Music. The one-year-old boy Madonna is hoping to adopt was given a hero's welcome Tuesday as he returned for the first with his new mother to the Malawian orphanage which had been his home. Little David Banda, whose adoption has still to be finalised by authorities in the impoverished southern African nation, smiled and waved to a group of his old friends as he arrived at the "Home of Hope." Around 200 villagers had converged at the entrance to the orphanage, based some 110 kilometres (70 miles) from the capital Lilongwe, for the arrival of David and the pop star who was also accompanied by her biological daughter Lourdes. The villagers competed for space with a team of around a dozen international news photographers who were trying to get snaps of the singer who is in on a three-day visit to Malawi. The villagers cheered and clapped as the entourage entered a hall at the orphanage where around 500 orphans had assembled to meet her. Ahead of the arrival, some of the orphans had hurled stones at the photographers who were later brushed aside by the singer's team of bodyguards. Madonna said little to a group of assembled reporters, merely saying: "It's great to be here". She had been expected to talks with David's biological father Yohane in a private get-together at the orphanage but asked whether the meeting would take place, she answered: "I don't know." In an interview with AFP last week, Yohanage said he would be "be very happy to meet my son" as well as Madonna whom he had only previously briefly encountered at court during the adoption process. Local rights groups have accused Madonna of using her wealth and status to fast-track the adoption process and take David out of the country whom she first set eyes on in October. Many of those assembled outside the orphanage however said they were delighted that the youngster, whose mother died shortly after childbirth, was to enjoy a lifestyle they could only dream about. Frank Tembo, who lives in the village of Mchinji, said he had come to the orphanage very early in the morning to get a glimpse of David and Madonna. "I feel so happy to have seen David and Madonna," he said. "I am going home to tell my wife that our son, David, is fine and doing well." The orphanage, which lies at the foot of the Mchinji mountain, has undergone a makeover in advance of the visit with staff painting billboards and sprucing up the garden and the lawns. Madonna's spokeswoman has denied reports that she is also on the lookout in Malawi for a little sister for David and her biological children Rocco and Lourdes. While in Malawi, Madonna is expected to film scenes for a film about saving Malawian orphans, called "Raising Malawi" in which she is also tipped to interview South Africa's former president Nelson Mandela. Madonna flew to Malawi on a silver jet Monday to continue her charity work in the impoverished southern African country, bringing along the Malawian boy she is in the process of adopting. The 48-year-old pop star, wearing a baseball cap, carried a small boy down the steps of the jet, and a child's seat was fixed into a waiting sport utility vehicle. Her three-vehicle motorcade then drove off at top speed to a luxury lodge, followed by journalists. 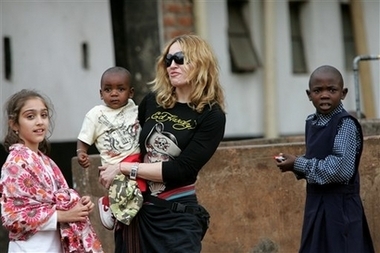 Madonna visited Malawi last fall to pick up 1-year-old David Banda, who was in an orphanage after the death of his mother.That visit set off a controversy over concerns that regulations were being swept aside to benefit a pop star who has been generous to the country. Madonna and her 38-year-old filmmaker-husband, Guy Ritchie, were granted an interim court order Oct. 12 allowing them to take initial custody of David. Under Malawi regulations, prospective parents must undergo an 18- to 24-month assessment period, but Madonna was allowed to take the boy to her London home soon after the court order. Malawian child welfare officials are expected to file a report on the suitability of the couple as adoptive parents after two trips to their London residence in May and December. Madonna says she has followed the law. After a rest in Lilongwe, Madonna toured U.N.-backed development projects in the small village of Mtanga, where farmers are being helped to grow maize and start fish farming. The singer, dressed in combat trousers, khaki T-shirt and black boots, was greeted by singing women and children as she inspected the maize crop and storage facilities and stood by the fish pond. 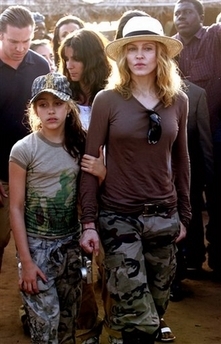 Her 9-year-old daughter, Lourdes, accompanied Madonna on her trip to Mtanga. Madonna'sNew York-based publicist Liz Rosenberg said the singer was visiting to continue her work with her Raising Malawi organization and denied speculation of another adoption. "She is overseeing the building of a children's health care center. She is absolutely not adopting another baby," Rosenberg said in a statement. There has also been much activity at the Home of Hope orphanage where David was cared for. The road to the village of Mchinji have been graded, new flowers planted and the children have received new uniforms. Three local police officers have been posted at the orphanage. David's father, Yohane Banda, surrendered his son to the orphanage after his wife died of childbirth complications. The couple's two other sons died in infancy from malaria.